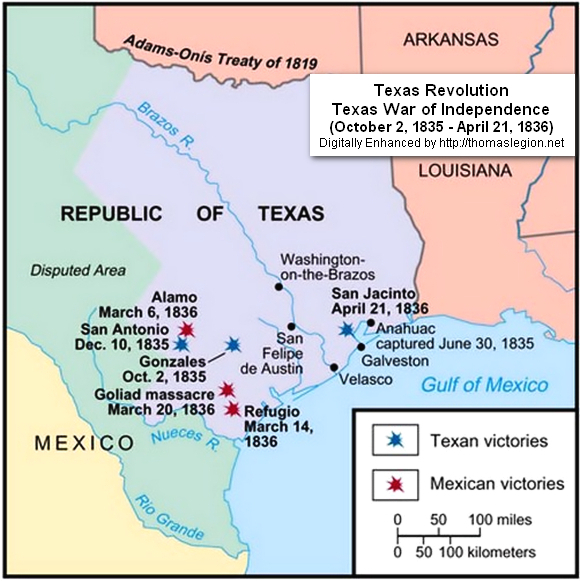 "Texas Revolution and Texas Independence History..."
The Texas Revolution, commonly referred to as the Texas War of Independence, was the military conflict between the government of Mexico and Texas colonists that began October 2, 1835, and resulted in the establishment of the Republic of Texas after the final battle on April 21, 1836. 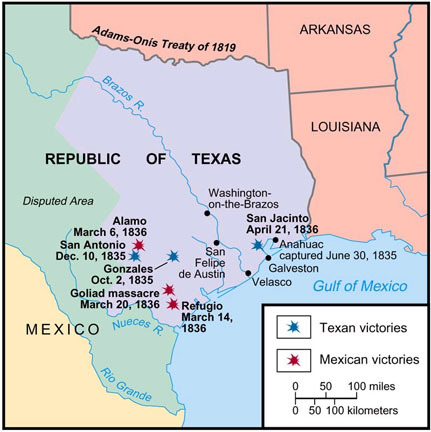 Mexico's refusal to recognize the Republic of Texas (1836-1846) and its continual border disputes with the United States caused intermittent conflicts between the two nations during the 1840s. With the annexation of Texas by the United States as the 28th State on December 29, 1845, tensions increased before being resolved on the battlefields of the Mexican–American War of 1846-1848 (aka US - Mexican War). As the nation rapidly acquired large amounts of real estate and spanned from sea to shining sea, slavery was placed on center state as both houses debated its expansion into the new territories. The subject was settled with Texas, because it had entered the Union as a slave state. 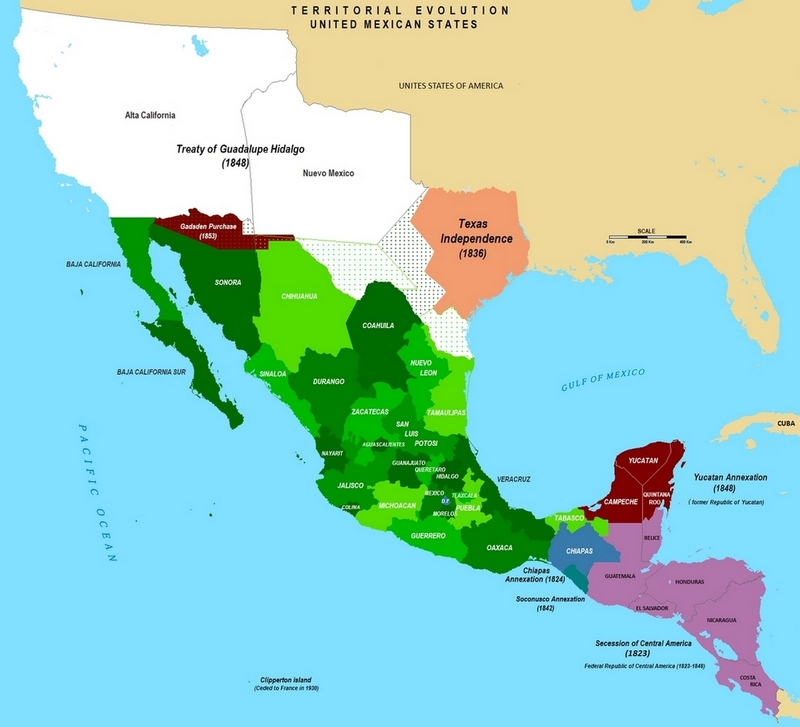 The Mexican War for Independence (1810–1821) severed control that Spain had exercised on its North American territories, and the new country of Mexico was formed from much of the individual territory that had comprised New Spain. On October 4, 1824, Mexico adopted a new constitution which defined the country as a federal republic with nineteen states and four territories. The former province of Spanish Texas became part of a newly created state, Coahuila y Tejas, whose capital was at Saltillo, hundreds of miles from the former Texas capital, San Antonio de Bexar (now San Antonio, Texas, USA). The new country emerged essentially bankrupt from the war against Spain. With little money for the military, Mexico encouraged settlers to create their own militias for protection against hostile Indian tribes. Texas was very sparsely populated and in the hope that an influx of settlers could control the Indian raids, the government liberalized immigration policies for the region. The first group of colonists, known as the Old Three Hundred, had arrived in 1822 to settle an empresarial grant that had been given to Stephen F. Austin. Of the 24 empresarios, only one settled citizens from within the Mexican interior; most of the remaining settlers came from the United States. The Mexican-born settlers in Texas were soon vastly outnumbered by people born in the United States. To address this situation, President Anastasio Bustamante implemented several measures on April 6, 1830. Chief among these was a prohibition against further immigration to Tejas from the United States, although American citizens would be allowed to settle in other parts of Mexico. Furthermore, the property tax law, intended to exempt immigrants from paying taxes for ten years, was rescinded, and tariffs were increased on goods shipped from the United States. Bustamante also ordered all Tejas settlers to comply with the federal prohibition against slavery or face military intervention. These measures did not have the intended effect. Settlers simply circumvented or ignored the laws. By 1834, it was estimated that over 30,000 Anglos lived in Coahuila y Tejas. compared to only 7,800 Mexican-born citizens. By 1836, there were approximately 5,000 slaves in Texas. Long-running political and cultural clashes between the Mexican government and the settlers in Texas were exacerbated after conservative forces took control and the Siete Leyes (Seven Laws) of 1835 were approved. It displaced the federal Constitution of 1824 with the 1835 Constitution of Mexico, thereby ending the federal system and establishing a provisional centralized government in its place. The new laws were unpopular throughout Mexico, leading to secession movements and violence in several Mexican states. The Texas Revolution began with the Battle of Gonzales on October 2, 1835, and ended with the Battle of San Jacinto on April 21, 1836. There were, however, earlier clashes between Mexican forces and groups of colonists, so it is impossible to set dogmatic limits for the Revolution. 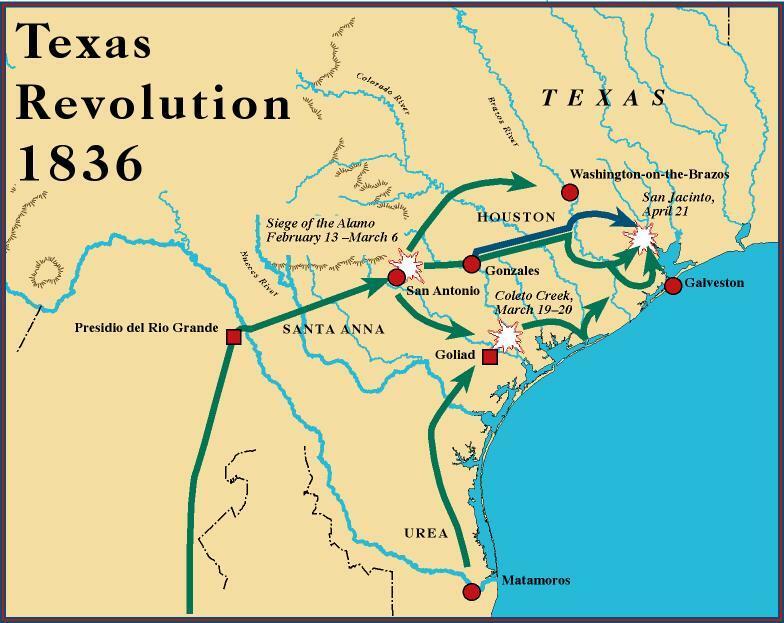 The Texas Revolution, nevertheless, experienced the following battles and skirmshes: Gonzales, Goliad, Lipantitlán, Concepción, Grass Fight, Béxar, San Patricio, Agua Dulce, The Alamo, Refugio, Coleto, and San Jacinto. Warfare began in Texas on October 2, 1835, with the Battle of Gonzales. Early Texan Army successes at La Bahía and San Antonio (Battle of Goliad, Siege of Béxar) were soon reversed when the Mexican Army retook the territory a few months later (Battle of Coleto, Battle of the Alamo). The war ended at the Battle of San Jacinto, where the Texian army under General Sam Houston routed the Mexican forces with a surprise attack. The Texas Revolution or Texas War of Independence was an armed conflict between Mexico and settlers in the Texas portion of the Mexican state of Coahuila y Tejas. The war lasted from October 2, 1835 to April 21, 1836. However, a war at sea between Mexico and Texas would continue into the 1840s. Animosity between the Mexican government and the American settlers in Texas, as well as many Texas residents of Mexican ancestry, began with the Siete Leyes of 1835, when Mexican President and General Antonio López de Santa Anna abolished the federal Constitution of 1824 and proclaimed the more centralizing 1835 constitution in its place. New laws enacted by a centralized government in Mexico were unpopular and led to secession movements and violence in several Mexican states. War began in Texas on October 2, 1835, with the Battle of Gonzales. Early Texian Army successes at La Bahia and San Antonio were soon met with crushing defeat at the same locations a few months later. The war ended at the Battle of San Jacinto where General Sam Houston led the Texan Army to victory over a portion of the Mexican Army under Santa Anna, who was captured shortly after the battle. The conclusion of the war resulted in the creation of the Republic of Texas in 1836. With Santa Anna a prisoner, his captors forced him to sign the Treaties of Velasco on May 14, 1836. The treaty recognized Texas' independence and guaranteed Santa Anna's life. The initial plan was to send him back to Mexico to help smooth relations between the two states. His departure was delayed by a mob who wanted him dead. Santa Anna, declaring himself as the only person who could bring about peace, was sent to Washington, D.C., by the Texas government to meet President Jackson in order to guarantee independence of the new republic. But unknown to Santa Anna, the Mexican government deposed him in absentia; thus, he no longer had any authority to represent Mexico. The Treaty of Velasco was never ratified in Mexico, and from the end of the revolution to roughly the beginning of the Mexican-American War, the Texas navy was tasked with forcing the Mexican Government to accept Texas independence. Although fighting between the Mexican and Texian armies ceased for the time being, battles on water and on the coast continued. Some of the notable naval conflicts were the Battle of Brazos River, the Battle of Galveston Harbor and the Naval Battle of Campeche. Santa Anna re-emerged as a hero during the Pastry War in 1838. He was re-elected President, and in early 1842 under his orders, expeditions into Texas were led by Ráfael Vásquez with 500 men, then General Adrian Woll with 1,400 men. Mexican troops commanded by Vasquez occupied Goliad, Refugio, and Victoria and, on March 5, entered San Antonio. On March 15, a Texian militia gathered in San Antonio only to find the Mexican troops had left. On September 11, 1842, Woll's troops occupied San Antonio. On September 17 or 18, over 200 Texian militia under Mathew Caldwell ambushed 500 of Woll's troops and won the Battle of Salado Creek. 53 Texians responding to Caldwell's call for reinforcements were surprised near Salado Creek and killed, many in cold blood after surrendering, in the Dawson Massacre. Woll retreated to Mexico with many hostages, including the local judge, clerk, district attorney and all attorneys attending the court session. These hostages remained in captivity for several years. Texian's pursuing the Mexicans and seeking retribution included the ill-fated Mier Expedition. Small clashes arose between the two countries for several years afterward. 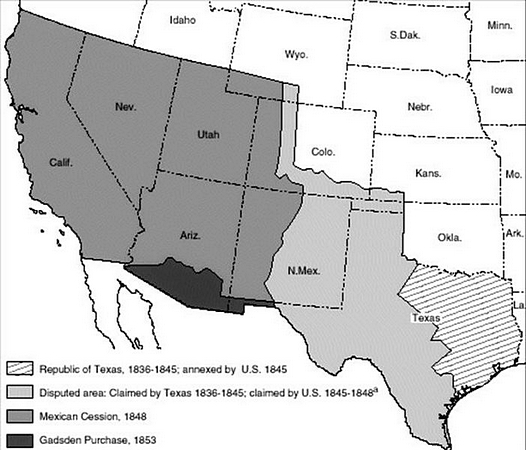 The war between Texas and Mexico did not truly come to an end until the Mexican-American War of 1846. 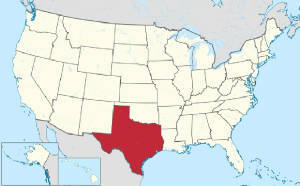 In 1845, the United States of America annexed the Republic of Texas and admitted it to the Union as the 28th state. 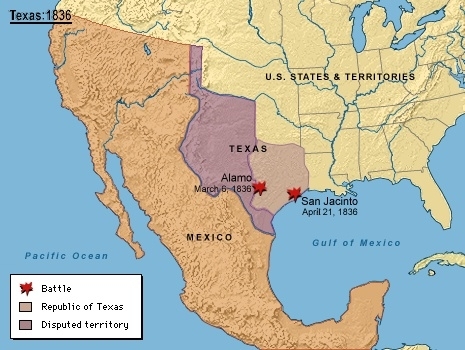 The U.S. thus inherited Texas's border dispute with Mexico; this quickly led to the Mexican-American War, during which the U.S. captured additional territory (known as the Mexican Cession of 1848), extending the nation's borders all the way to the Pacific Ocean. 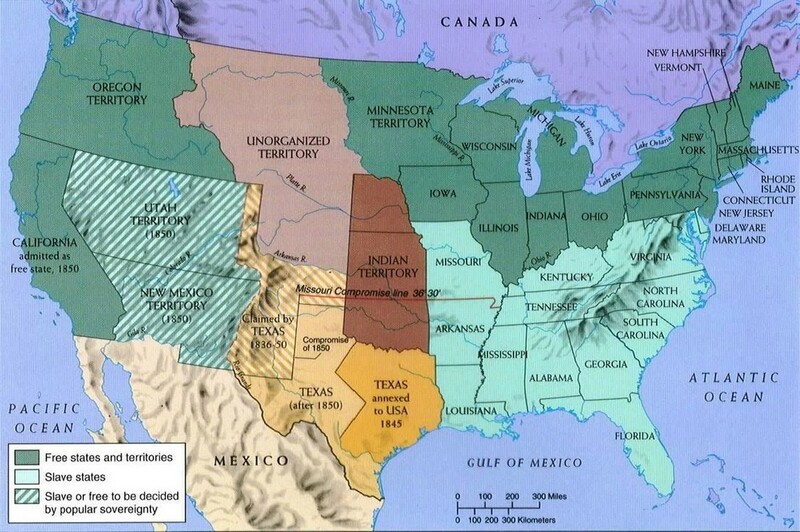 Texas claimed the eastern part of this new territory, comprising parts of present-day Colorado, Kansas, New Mexico, Texas, Wyoming, Utah, and Oklahoma. The resulting dispute among Texas, the federal government, and New Mexico Territory was resolved in the Compromise of 1850, when much of these lands became parts of other territories of the United States in exchange for the U.S. federal government assuming the Texas Republic's $10 million in debt. After a series of United States victories, the Treaty of Guadalupe Hidalgo ended the two year war. 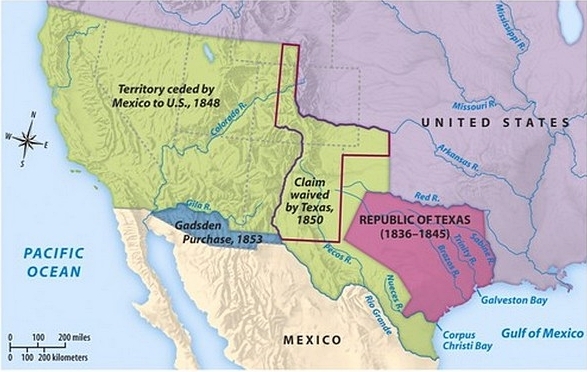 In return, for US$18,250,000, Mexico gave the U.S. undisputed control of Texas, ceded the Mexican Cession in 1848, most of which today is called the American Southwest, and Texas's borders were established at the Rio Grande. Sources: Barr, Alwyn (1996), Black Texans: A history of African Americans in Texas, 1528–1995 (2nd ed. ), Norman, OK: University of Oklahoma Press, ISBN 0-8061-2878-X; Barr, Alwyn (1990), Texans in Revolt: the Battle for San Antonio, 1835, Austin, TX: University of Texas Press, ISBN 0-292-77042-1, OCLC 20354408; Brands, H.W. (2005), Lone Star Nation: The Epic Story of the Battle for Texas Independence, 1835, New York: Random House, Inc., ISBN 1-4000-3070-6; Castaneda, H.W. (1970), The Mexican Side of the Texas Revolution, Texas: Graphic Ideas, ASIN B003M0PG1S; Davis, William C., Lone Star Rising: The Revolutionary Birth of the Texas Republic, Free Press (2004) ISBN 0-684-86510-6; del la Teja, Jesus (1991), A Revolution Remembered: The Memoirs and Selected Correspondence of Juan N. Seguin, Austin, TX: State House Press, ISBN 0-938349-68-6; Edmondson, J.R. (2000), The Alamo Story-From History to Current Conflicts, Plano, TX: Republic of Texas Press, ISBN 1-55622-678-0; Fehrenbach, T. R. (2000), Lone Star: a history of Texas and the Texans, Da Capo Press, ISBN 0-306-80942-7, 9780306809422; Groneman, Bill (1998), Battlefields of Texas, Plano, TX: Republic of Texas Press, ISBN 978-1-55622-571-0; Hardin, Stephen L. (1994), Texian Iliad – A Military History of the Texas Revolution, Austin, TX: University of Texas Press, ISBN 0-292-73086-1, OCLC 29704011; Huson, Hobart (1974), Captain Phillip Dimmitt's Commandancy of Goliad, 1835–1836: An Episode of the Mexican Federalist War in Texas, Usually Referred to as the Texian Revolution, Austin, TX: Von Boeckmann-Jones Co.; Lack, Paul D. (1992), The Texas Revolutionary Experience: A Political and Social History 1835–1836, College Station, TX: Texas A&M University Press, ISBN 0-89096-497-1; Lord, Walter, A Time to Stand,; Lincoln: University of Nebraska Press (1961) ISBN 0-8032-7902-7; Manchaca, Martha (2001), Recovering History, Constructing Race: The Indian, Black, and White Roots of Mexican Americans, The Joe R. and Teresa Lozano Long Series in Latin American and Latino Art and Culture, Austin, TX: University of Texas Press, ISBN 0-292-75253-9; Nofi, Albert A., The Alamo and The Texas War for Independence, Da Capo Press (1992) ISBN 0-306-81040-9; Santos, Richard G. (First Edition, 1968), Santa Anna's campaign against Texas, 1835-1836;: Featuring the field commands issued to Major General Vicente Filisola, Texian Press, ASIN B0006BV0Y8; Schwaller, John Frederick (February 22, 2011), The History of the Catholic Church in Latin America: From Conquest to Revolution and Beyond,, NYU Press, ISBN 0-8147-4003-0; Scott, Robert (2000), After the Alamo, Plano, Texas: Republic of Texas Press, ISBN 978-0-585-22788-7; Todish, Timothy J.; Todish, Terry; Spring, Ted (1998), Alamo Sourcebook, 1836: A Comprehensive Guide to the Battle of the Alamo and the Texas Revolution, Austin, TX: Eakin Press, ISBN 978-1-57168-152-2; Winders, Richard Bruce (2004), Sacrificed at the Alamo: Tragedy and Triumph in the Texas Revolution, Austin, TX: State House Press, ISBN 1-880510-81-2.